In 2010, Justin Carl Moose, a self-described “Christian counterpart to Osama bin-Laden,” planned to blow up an abortion clinic. He was in possession of means to make explosives, including potassium permanganate, fuse wires, and metal shavings to make the explosive TATP. And in May 2013, officials arrested Buford “Bucky” Rogers, who reportedly held white supremacist views and who law enforcement officials say cheered the Boston marathon bombing. Rogers made homemade bombs with the military-grade explosive PETN, crafted Molotov cocktails filled with “homemade napalm,” and had a loaded SKS rifle. He discussed using the weapons locally. Most people have likely never heard of these two men, possibly because their plans received relatively little media coverage. Combined, the New York Times and Washington Post ran just two articles on Rogers. They printed no stories about Moose. Ultimately for their alleged plotted crimes, Rogers was sentenced to 40 months (3.3 years) in federal prison, and Moose was sentenced to 30 months (2.5 years). Compare their cases to Antonio Martinez, who was alleged to have acted in the name of Islam when he planned to bomb a military recruitment station outside Baltimore and shoot personnel as they fled the scene. Law enforcement provided Martinez a fake bomb. Together, the New York Times and Washington Post published ten articles about Martinez. Martinez was charged with planning to use a weapon of mass destruction and was sentenced to 300 months (25 years) in federal prison. This report seeks to explore whether and why these cases, and those like them, have such different outcomes. More specifically, this report examines the extent to which the perceived identity of an alleged perpetrator as either Muslim or non-Muslim shapes both print media coverage and legal responses to ideologically motivated violence (IMV) in the United States. This report defines violence as ideologically motivated when the perpetrator of violence is perceived by a) the media and/or b) law enforcement to be committing the violence to promote an ideology. This report does not attempt to determine perpetrator ideologies, nor does it endorse the accuracy of these assessments by media or law enforcement. Rather, it analyzes what happens to perpetrators based on the perception of their ideologies. Our analysis of the examples examined in this report found that, for similar plots, Muslim-perceived perpetrators received harsher legal charges and longer prison sentences than their non-Muslim counterparts. Perpetrators identified as Muslim also had qualitatively different media coverage than perpetrators not identified as Muslim. On average, prosecutors sought three times the sentence length for Muslim perpetrators as for perpetrators not identified as Muslim for similar plots of attempted ideologically driven violence (230 months vs. 76 months). 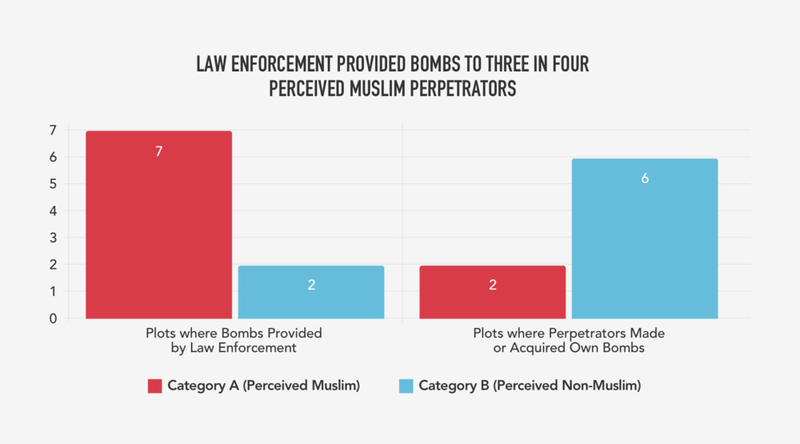 Additionally, Muslim perpetrators received four times the average sentence as their non-Muslim counterparts for attempted plots of similar conduct (211 vs. 53). Moreover, undercover law enforcement or an informant provided the means of the crime (such as a firearm or inert bomb) in a majority (two-thirds) of convictions in plots involving a perceived Muslim perpetrator, but in a small fraction (two out of twelve) of those involving a non-Muslim perpetrator. In terms of print media coverage, Muslim-perceived perpetrators received twice the absolute quantity of media coverage as their non-Muslim counterparts in the cases of violent completed acts. For “foiled” plots, they received seven and half times the media coverage as their counterparts. Differences also extended to media references to a perceived Muslim perpetrator’s religion as compared to ideologies of perceived non-Muslims, mentions of specific phrases such as “terrorist” or “terrorism,” and coverage of the ultimate prison sentences. We divided our incident analysis into two categories, defined below, based on media reports and publicly available legal documents and databases. We base our categories on the law enforcement assessment of identity and motivation, but do not endorse these assessments. Individuals committing or plotting violent acts who are perceived to be Muslim and allegedly acting in the name of Islam. Individuals committing or plotting violent ideologically motivated acts who are not perceived to be Muslim. IMV incidents associated with perpetrators of both categories were selected from existing, published datasets of ideologically motivated violence. Based on a combination of these existing datasets, United States-based IMV incidents from 2002 to 2015  resulting in two or more fatalities  were included. We also included a set of violent ideological plots that were prevented or foiled prior to completion, either by law enforcement investigation or through a “sting” operation. The violent plots included bomb plots and firearms plots. As used in this report “violent plot” and “plot” are interchangeable. The goal of selecting this set of incidents was not to create a new or comprehensive database of IMV acts. Instead, the purpose was to facilitate as best as possible an “apples to apples” study, i.e., to compare Category A and Category B perpetrators whose conduct and impact were similar in severity and quality. Incident selection was done prior to any analysis and was not changed after analysis began. The IMV incidents were then analyzed to determine media and legal outcomes. What kind of media outreach was issued by law enforcement regarding the case. This methodology is discussed in further detail below. The media analysis looked exclusively at coverage in the New York Times and Washington Post. These outlets were chosen for a number of reasons. First, we chose print media that enjoys comprehensive archives with content that can be easily analyzed to facilitate systematic analysis. Second, we chose the two most reputable and purportedly “liberal” national newspapers which would have the best chance of fairly portraying minority communities. Challenge: Are We Comparing Apples to Apples? Some may suggest that differences in nature and scale of offenses may make it difficult to analyze or draw inferences from the legal and media treatment of the two categories of perpetrators. While we cannot rule out that such differences might partly explain some differences in outcome, we have taken a number of steps to ensure as close to an “apples to apples” comparison as possible. An incident resulting a greater number of fatalities is generally more severe than one with fewer. The weapon used in a violent incident or planned for use in a violent plot indicates the intended scale of the violent act. The level of harm the perpetrator aimed to cause, as alleged by law enforcement. The type of target is recorded in incidents, such as whether it is a religious community, a racial or ethnic group, an LGBT individual or group, or the government. Where applicable, any accused co-perpetrators or co-conspirators are recorded. Category A and Category B set contains a range of incidents of varied targets and apparent motivations, from anti-government to racially- or religiously-motivated, as well as incidents of both small and large scale. Examples of Category A violent plots included planned efforts to bomb and shoot military recruitment centers, to murder military employees with an AK-47, to bomb city buildings, to bring a car bomb to an airport tarmac, to bomb a Christmas tree-lighting ceremony, and to engage in mass shootings against civilians. Examples of Category B violent plots included plans to take over a courthouse with an AK-47, to use assault rifles to murder civilians, to bomb federal buildings and public infrastructure, to deploy the biological weapon ricin against civilians, and to attack a Mexican consulate in St. Paul with a truck bomb. Category A bomb plots that were not carried out were almost exclusively charged as “weapons of mass destruction” (WMDs). (Legally, the term “WMD” is different from the common meaning of nuclear, chemical, or biological weapons, as it applies to conventional explosives like bombs or grenades). On the other hand, most of the Category B bomb plots that appear to have qualified as WMDs, based on alleged facts, were not. The distinction is important because the non-WMD defendants typically received less than five years in prison, whereas charging a bomb plot as WMD usually led to over a twenty-year sentence. Category B perpetrators were often charged with a lesser charge even when they obtained or made their own military-grade explosives. The Category B violent plot receiving the most media coverage (six articles) involved four members of a north Georgia militia planning to bomb federal buildings and attack cities with deadly ricin. They were charged with conspiracy to produce biological weapons. Yet, this media coverage was still lower than the average number of articles written about a Category A incident (7.5 articles). A large majority of articles referencing Category A offenders contained the terror-focused terms “terror,” “terrorism,” and/or “terrorist” across all subsets (ranging from 54% to 68%), compared to just roughly a quarter of articles referencing Category B offenders, despite both categories of offenders being alleged to have been ideologically motivated and mostly targeting civilians. As a point of contrast, a right-wing extremist ideology or white supremacist ideology is rarely, if ever, attributed broadly to individuals with a white identity  or to those who adhere to a right-wing ideology more generally. This is, of course, the appropriate outcome, yet it is often not the case for certain groups in the United States, with unfair treatment of Muslims being a particularly strong example. Collective guilt or punishment reinforces prejudices that an identity of belonging to a particular faith makes one more predisposed to committing acts of violence. These prejudices are of course discriminatory and dangerous. These terms not only carry significantly varying amounts of political and moral weight, but framing an act as “terrorism” is enough to amplify media coverage, shift policy, and result in vastly increased legal sanctions and punishment. Disparate terms also affect priorities in addressing extremism. Due process for individuals: The distinction between a standard criminal charge, a hate crime enhancement, and a terrorism prosecution, for example, would be highly significant to a defendant. The potential sentences differ by years, decades or even life in prison, as well more difficult defenses at trial. Public safety and sound policy: The visibility of the label “terrorism” in public discourse makes the use of the term a priority setter for resources and funding. Making sure that the label accurately represents threats to public safety, not just biases, is necessary to ensure sound and effective policy as well as avoid wasted resources. Ideologically motivated violence receives a wide range of responses in both the legal system and media. The legal system may charge ideological violence as a hate crime or under terrorism statutes, and the punishment can range from capital punishment to no punishment. Media responses to ideologically motivated violence can also vary wildly. Sometimes IMV incidents receive no coverage at all. Other times, they dominate news cycles for days or weeks. Questions we sought to explore through this study included whether a segment of print media was more likely to 1) label an incident as “terrorism,” 2) cover the incident more vigorously, or 3) frame coverage of perpetrators differently – all based on the perpetrator’s perceived ideology or identity. Similarly, we also sought to explore whether the legal system treats perpetrators of violence differently based on identity or ideology including 1) If law enforcement investigative strategies differ based on the identity of the alleged perpetrators, 2) if and how law enforcement describe incidents of violence differently or more aggressively, 3) whether prosecutors charge suspects differently for similar alleged acts, and 4) whether sentencing outcomes are different. Finally, we sought to explore the interplay and potential links between the media and legal systems and how potential biases within one system may reinforce biases in the other. As a whole, this report seeks to identify the extent to which the perceived identity or ideology of a perpetrator of violence as either Muslim or non-Muslim shapes both legal and print media responses. In the legal system, by examining legal proceedings in federal- and state-level prosecutions and law enforcement statements to the press and public. This report builds on but is also distinct from prior studies examining news media coverage of incidents of mass violence. While our report examined quantitative media coverage like the Kearns study, we focused on just two top print news sources and drew our findings based on examining dozens of specific sampled incidents. Moreover, we coupled a quantitative analysis with an examination of qualitative coverage, including an analysis of framing and language choices at the article level for a set of case studies. Finally, we examined legal outcomes and related metrics separate and alongside media coverage to explore another equally critical system. We believe, ultimately, that our findings are consistent with the conclusions of prior reports exploring media and other types of bias involving treatment of perpetrators of ideological violence based on their perceived identity or ideology. It does not seek to lay out specific policy recommendations. Why Do Disparities in Handling Cases of Ideological Violence Matter? How crimes are labeled directly affects charging decisions, likelihoods of convictions, and severity of sentences. The labels can also shape how the public thinks about IMV. Many different ideologies have motivated violent acts in the United States, including racial animosity, anti-government views, and anti-abortion or religious extremism. In most cases, perpetrators have multiple reasons, both ideological and non-ideological, for committing violence. Assessing why individuals commit violence is often a difficult task, because the perpetrators may not subscribe to a clearly articulated ideology. 1. Addressing disparities can save lives. 2. Disparities based on identity violate civil rights and fuel discrimination against Muslims. Disparities in handling cases of ideological violence in the legal system are inconsistent with the guarantees of equal protection and due process provided under the U.S. Constitution and under human rights law. They run afoul of the basic concept that individuals should be held accountable based on the actions that they commit rather than their identity or religion. Communities of color in the United States, particularly Black people, have long been subject to deep structural racial bias within legal systems, which systematically manifests disturbing outcome disparities. Racial disparities have been identified at nearly every stage of the criminal legal system, including policing and arrests, charges, bail determinations, convictions, and sentencing. Extensive studies have shown that the media, including news coverage, has perpetuated and fueled many of those biases in its treatment of Black people as compared to other identity groups, especially whites. This report seeks to explore whether similar biases exist in relation to how Muslim-perceived individuals involved in or suspected of criminality are treated by these interconnected systems. 3. Biases in response leads to resource misallocations. Biases in responding to ideological violence can lead to dramatic resource misallocations. If media choices create the false impression that most, if not all, “terrorism” is perpetrated by Muslims,  it could mean that non-Muslim perpetrators of IMV do not receive proportionate media attention or legal resources. Relatedly, focusing outsized attention on Muslim-perceived perpetrators of ideological violence can lead to biased outcomes for these individuals in media and legal systems, a point borne out by the findings of this report. Distressingly, these outcomes can lead to backlash and discrimination against Muslim communities and others perceived to be Muslim. The print media industry, including primarily the New York Times and Washington Post, the newspapers selected for examination in this study: The news media strive to report accurately, fairly, and transparently to their readership and the public. Students of journalism also have a stake in adopting better and more self-reflective practices. Prosecutors and law enforcement: Disparate treatment or even perceptions of disparate treatment can impact trust between communities and law enforcement. The Justice Department is an important stakeholder, as prosecutors are involved in charging decisions that heavily impact the outcomes of cases. Investigators also make choices on how to respond to cases and whether or not to provide weapons to individuals. The public: The public has a right to know whether the information they receive from trusted sources accurately cover and frame news stories. Similarly, the public needs to know how resources are being allocated to address cases of ideologically motivated violence. Policymakers: Policymakers are responsible not only for allocating resources, but also for setting priorities and directing public conversations. Policymakers also play a central role in defining criminal laws and setting (and limiting where appropriate) the tools available for law enforcement. Muslim communities: Muslims have an important, if not existential, stake in the policies and attitudes that directly affect their community. These datasets were selected for several reasons. Each adheres to the broader definition of violence committed in the name of an ideology. All three have transparent methodologies. 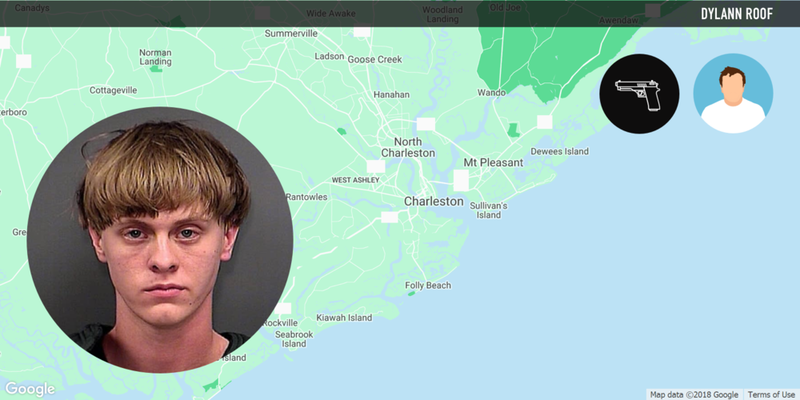 The START database includes a definition of ”terrorism” for coding incidents, requiring the violent acts contained in their set to be aimed at a “political, economic, religious, or social goal.”  The SPLC set is based partly on the START data as well as SPLC’s own data collection and is similarly restricted to ideological violence. The Intercept’s Trial and Terror database is based on Justice Department publications, court files, and Bureau of Prisons data, and has been an ongoing project of journalist Trevor Aaronson for over eight years. It focuses exclusively on federal terrorism prosecutions. The first two databases were used for all incidents, and the last two were used for plots, since the START database does not easily differentiate between completed acts and plots. Date range: The year range of 2002 to 2015 captured the most consistent and available data set among the databases, and it reflects a time period across two different U.S. presidential administrations. Violent in nature: Plots were excluded where they were nonviolent in nature, such as travel, financial, or similar cases. The plots dataset also did not include attempted crimes that failed, but rather included incidents where perpetrators had a plan to carry out an act of violence but law enforcement intervened to disrupt. Inclusion of violent plots: Plots—i.e., the planned commission of offenses that are not carried out—were the most reliable dataset that included completed legal proceedings. Many completed instances of ideologically motivated violence result in the death of the perpetrator, which means that there are no formal legal proceedings. The inclusion of plots requires that there was a prosecution, meaning that there could be many cases where violent plots are thwarted but there is insufficient evidence to bring a prosecution. All such incidents from databases were incorporated. As a result, every completed incident analyzed in this report’s dataset involved at least one fatality at the hands of a perpetrator, but for the May 2015 Garland, TX, shooting, which resulted in the deaths of two perpetrators and injury to a law enforcement officer. Three incidents were not included in the legal analysis, as the legal proceedings were still ongoing as of the preparation of the report. Each incident was run through a legal and media analysis, under which numerous metrics were coded for each incident (a full list of the metrics is contained in the appendix). Relying on established datasets enhances the objectivity of the report, but it also means that the report is constrained by the same limitations as those datasets. Namely, no dataset will be 100% comprehensive or void of subjective elements, but the methodology outlined aims to objectively sample the universe available. The dataset does not include incidents past 2015, as the START database only contained incidents through 2015 at the start of this research project in early 2017. The dataset covered by the report, however, covers both Republican and Democratic administrations, to ensure that any findings are not partisan in outcome. The violent plots included were ones that were prosecuted (otherwise there would be no court documents to reference). However this also means that the study did not examine violent plots that were not prosecuted—i.e., were thwarted but there was insufficient evidence to bring a prosecution. Ideology is a belief that serves as the basis for motivating or justifying action, whereas identity is a characteristic of an individual or population, often immutable, that defines how that individual or population is perceived by society. A major challenge in this report is the concern that for Category A perpetrators, ideology and identity are often conflated. That means that the perception of ideology—violence being allegedly done in the name of Islam—is coupled with a perception that the perpetrator is a Muslim. Thus, a factor of identity, in this case a person’s faith, is also perceived to be the basis for ideologically motivated violence for Category A perpetrators. This is in contrast with Category B perpetrators, where this is not necessarily the case. Many perpetrators in the Category B set have perceived ideologies that are disconnected from their race or religion. This conflation of ideology and identity makes it easier to attribute collective guilt and leads to public acceptance of discriminatory policies. As a point of contrast, a right-wing extremist ideology or white supremacist ideology may not necessarily be attributed to all individuals sharing either right-wing political views or individuals who are white. Doing so with some groups more than others reinforces prejudices that an identity of belonging to a particular faith makes one more predisposed to committing acts of violence. These prejudices are of course discriminatory and dangerous. The U.S. legal system and the media do not operate in vacuums. The two are intimately linked. The media looks closely to law enforcement to see how it should report on coverage; and media attention often accompanies the allocation of law enforcement resources and prosecution decisions. This report hopes to encourage further investigation into this relationship. One of the goals of the report from the onset was to explore not just the individual roles that the media and law enforcement play in addressing cases of IMV, but to examine their relationship. This is difficult to do in a complex media landscape, and so is attributing causal relationships for media coverage. To explore this relationship, the research in this report went beyond evaluating the media and legal analysis as separate bubbles. The report attempted to identify if and when metrics reflected in the legal and media analyses were correlated with one another. Some of the relationships examined included the relationships of the quantity of media coverage to the nature and severity of charging, as well as whether the increased references to “terrorism” in media coverage were correlated with a case being prosecuted as such. The inclusion of a perpetrator or listing of an alleged ideology in this report is not a confirmation that said individual acted according to, or was motivated by, any ideology. It represents that the incident was included as ideologically motivated by the underlying datasets used in the report. Listed ideologies were obtained from the underlying datasets, charging documents, and/or reporting. Category B ideologies are specifically noted, while Category A offenders by definition are those perceived to be allegedly acting in the name of Islam. Bomb military recruitment station outside Baltimore, planned to set off a car bomb, and shoot people as they were running out. Plot to behead New York political activist Pamela Geller and police officers. Attempted to bring fake car bomb onto airport tarmac. Case studies were selected in order to provide in-depth comparisons, analysis, and context that data alone cannot provide. Relatedly, comparative case studies and specific news coverage provide a starting point to discuss areas of possible bias in media and law enforcement that underpin some of the quantitative findings in the section that follows. The data reinforces the trends highlighted by the case studies. Case studies were picked based on similarities of facts between cases that allowed for deeper comparisons. We based our assessment of whether or not cases could be compared on a number of factors, including the number of fatalities, the type of weapon used, the intended target, and the intended scale of the incident. Some may suggest that differences in nature and scale of offenses may make it difficult to compare the legal and media treatment of the two categories of perpetrators. We cannot rule out that such differences might partly explain aggregate differences in outcome. Nonetheless, we note that several of our case studies with analogous severity are quite often treated differently. When Are Bomb Plots Charged As Weapons of Mass Destruction? In 2010, Justin Carl Moose, a self-described “Christian counterpart to Osama bin-Laden” planned to blow up an abortion clinic. He was in possession of means to make explosives, including potassium permanganate, fuse wires, and metal shavings to make the explosive TATP. In 2013, Buford “Bucky” Rogers, who was perceived to have white supremacist views and who law enforcement officials say cheered the Boston marathon bombing, made homemade bombs with the military-grade explosive PETN, Molotov cocktails filled with “homemade napalm,” and had a loaded SKS rifle. He discussed using the weapons locally. in 2010, Antonio Martinez, perceived to be acting in the name of Islam, planned to bomb a military recruitment station outside Baltimore and shoot people as they were running out. Law enforcement provided Martinez a fake bomb. Of the three, Martinez, a Category A offender, was the only one who received a weapons of mass destruction charge. Moose and Rogers received 30- and 40-month sentences, respectively. Martinez’s sentence was 300 months. In the New York Times and Washington Post, Moose had zero and Rogers had two articles total. The same sources published a combined ten articles about Martinez. Justin Carl Moose planned to blow up an abortion clinic. He was in possession of means to make explosives, including potassium permanganate, fuse wires, and metal shavings to make the explosive TATP. Buford “Bucky” Rogers made homemade bombs with the military-grade explosive PETN, molotov cocktails filled with “homemade napalm,” and a loaded SKS rifle. He discussed using the weapons locally. Antonio Martinez planned to bomb a military recruitment station outside Baltimore and shoot people as they were running out. Rogers cheered the Boston marathon bombing. Finally, compare the cases of Joseph Benjamin Thomas and Matthew Aaron Llaneza. Both involved car bomb plots, although only one of the cases was charged under the WMD statute. Joseph Benjamin Thomas and Samuel James Johnson, 31 and 42, planned to attack the Mexican consulate in St. Paul with a truck loaded with flaming barrels of oil and gasoline. Matthew Aaron Llaneza expressed interest in joining the Taliban. He was provided a fake car bomb by the FBI which he delivered to a bank in San Jose. The pair planned to create an “Aryan Liberation Movement” to attack minorities and government officials. Johnson was a former leader of the neo-Nazi National Socialist Movement. At the time of the FBI operation, Llaneza’s family was trying to get Llaneza, who was mentally ill, psychological help. The following are a collection of media coverage for bomb plots that were charged with weapons of mass destruction. Attempted to set off a fake car bomb at a military recruitment center. Amassed assault weapons, body armor, and plotted to bomb a stretch of beach in Key West using an inert bomb that he attached nails to. Brought fake car bomb to a bank in San Jose. Family sought mental health support. Attempted to set off a fake car bomb at Christmas tree lighting. Plotted to build a truck-borne radiation weapon that could be turned on remotely. Plot to bomb federal buildings, attack Atlanta and other cities with deadly ricin. Media coverage of bomb plots dropped significantly in Category B cases when WMD charges were off the table, despite the severity of the plots. David Allen Brutsche and Devon Campbell Newman intended to kidnap a police officer at random, detain the officer in a crude jail, “try” the officer then execute him or her. Munir Abdulkader purchased an AK-47 with the intent of killing a specific military employee. Brutsche and Newman considered themselves sovereign citizens and conducted recruiting seminars on sovereign ideology. Abdulkader planned to travel to Syria to join ISIS. Many factors go into the publication of press releases, including factors that may not address the merits of any specific case, such as a press officer being off the desk. This report’s discussion of press releases does not attempt to explain why they may be issued in some cases and not others or why certain cases receive press from the Washington, DC, press office while others receive local press. However, it highlights data that is worth further investigation. The findings section indicated that perpetrator ideology was mentioned in press releases in both Category A and B cases. But the ways they are presented are often very different. The excerpts below illustrate examples of how Category A press releases on both the local and national level are directly framed as cases of ideologically motivated violence. “John Huggins, 48, of Tremonton, Utah, was sentenced to 27 months in federal prison for possession of an unregistered destructive device, announced Assistant Attorney General for National Security John P. Carlin and U.S. Attorney Carlie Christensen of the District of Utah. Johnson was part of an “Aryan Liberation Movement” and planned to attack minorities. These case studies were completed by an intensive review of responsive articles to identify the presence of certain additional measurements that would not be available via Boolean text searching, including references to a perpetrator’s perceived ideology or mental health, militant organizations related to a perpetrator’s perceived ideology, and whether community or family members were interviewed. Case studies also included notable article excerpts referencing the perpetrators that suggest and demonstrate certain biases in Category A print news coverage. Moreover, note the use of inclusion of “terrorism” in the phrase “Islamist terrorism” but no similar reference in describing the other ideology referenced in the paragraph. A low percent of articles included references to militant organizations or associations despite his own stated membership of…. This section presents key results of the empirical analysis of the IMV cases examined. Category A cases received over twice the amount of media coverage overall as Category B cases. The portion of the cases that were violent plots in Category A cases received 7.5 times more coverage than Category B. Category A violent plots were referenced in a ranged from one to 24 articles, with an average of 7.7 articles referenced per incident. Category B plots ranged from zero to six articles, with an average of one article per incident (and with most Category plots receiving no coverage in either newspaper). The most-covered incident in the set of Category B incidents (which had six articles written) involved a plot to spread a biological agent via ricin in the case of Frederick Thomas. The total of six articles referencing this incident was still less than the average of 7.7 in Category A cases. For plots, Category A cases received 7.75 times the coverage on average. For all other incidents, it was at least twice the coverage. On average, Category A primary incidents were referenced by the media at more than twice the rate of articles referencing Category B primary incidents. Category A primary incidents ranged from one to 79 articles, with an average of 36.5 articles per incident. Category B primary incidents ranged from zero to 83 articles, with an average of 15.8 articles. Category A high-intensity incidents were referenced at more than four times the rate than Category B high-intensity incidents were referenced. Category A high-intensity incidents had the following coverage: 562 articles (Nidal Hasan/Fort Hood), 684 articles (Syed Farook; Tashfeen Malik/San Bernardino), and 1340 articles (Tsarnaev brothers/Boston). Category B high-intensity incidents had the following coverage: 72 articles (Wade Michael Page/Oak Creek), 36 articles (Elliot Rodger/Isla Vista), and 557 articles (Dylann Roof/Charleston). Most striking here is the relatively minimal coverage of the both the Isla Vista and Oak Creek incidents. Both incidents involved seven fatalities with multiple others wounded. A large majority of articles referencing Category A offenders contained the terminology of “terror,” ”terrorism,” and “terrorist”  across all subsets, compared to nearly one in four articles referencing Category B offenders. In contrast, only an extremely small percent of articles referencing Category A offenders contained the term “hate,” while articles referencing Category B offenders contained the term “hate” significantly more. A relatively small portion of articles referencing Category A offenders contained uses of the terms “hate”/”hateful” across categories (7% of plots, 4.4% of high-intensity incidents, and 6.9% of primary incidents). Articles referencing the Category B offenders contained the term across two categories at a significantly higher rate (34.7% of high-intensity incidents, and 24.4% of primary incidents). This disparity is at least partially driven in part by newspapers reporting that some of the Category B offenders were under consideration to be, or were in fact, charged and/or prosecuted under hate crimes statutes unlike Category A offenders. But it also reflects the framing choices made by the media, as articles referencing Category B offenders raised the specter of the perpetrator’s “hateful” persona. Disparately, writers often include the term “terror” in a majority of Category A articles and rarely include the term “hate.” Articles referencing Category B incidents include the terms “terror” and “hate” at similar rates, albeit still in a minority of those articles. The use of the term “extreme,” (as in extreme views) “extremist,” or “extremism” followed a trend similar to the use of the term “terror” in comparing the two sets of offenders. A portion of articles referencing Category A offenders contained the term “extreme”/”extremist”/”extremism” across categories (17.5% of plots, 18.0% of high-intensity incidents, and 28.8% of primary incidents). Articles referencing Category B offenders contained the term somewhat less: 8.6% of high-intensity incidents, and 19.8% of primary incidents. (Category B plots were not examined due to low number of articles). No significant difference in the data findings between the New York Times and Washington Post was found. The legal analysis focused on violent plots, because the violent plots were the incidents that had the most comparable legal data available. The plots were primarily charged in federal court. Traditional criminal offenses like murder are typically charged at the state level, but offenses that violate federal laws or cross state lines are charged federally. Incidents in the primary database often did not lead to legal proceedings at all where the perpetrator was killed. Otherwise the cases leading to deaths were charged as murder on the state level. And the penalties (usually life imprisonment or death across the board) provided little data to compare. The violent plots set provided the ability to have more “apples to apples” comparisons. Most Category A perpetrators of violent ideological plots received more severe legal charges than Category B perpetrators. Federal charges for plots were divided into two categories. “Less severe” offenses included possession of a firearm while a felon, possession of explosives, and solicitation to commit a crime of violence. These offenses generally carry prison terms of less than ten years. “More severe” offenses included “weapons of mass destruction,” “material support,” and other offenses that can carry prison terms from decades to life. “More severe” offenses also tend to fall under federal terrorism statutes. The legal consequences of these offenses can lead to harsher conditions of confinement, such as at maximum- or super-maximum-security facilities, subjection to Special Administrative Measures (SAMs), and restrictions on communications and visitation. As discussed in the “apples to apples” section, both sets contained comparable severities of conduct and targets. 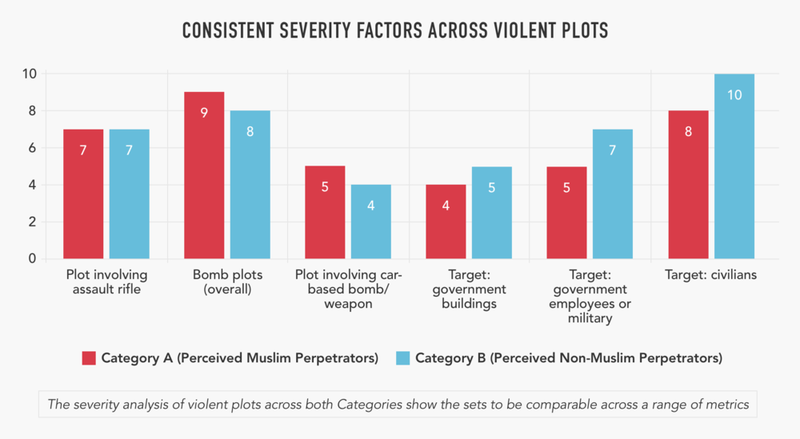 The severity analysis of violent plots across both Categories show the sets to be comparable across a range of metrics. Does not require “WMDs” in a traditional understanding of nuclear, biological, or chemical weapons, but can apply to conventional explosives like small bombs and grenades. Note that this discrepancy is not necessarily the result of prosecutor discretion: “material support” requires a connection, at least by ideology, to a Foreign Terrorist Organization. By nature most of the Category B offenders will be ineligible for material support, because domestic ideologies are generally not connected to a “designated” Foreign Terrorist Organization. The average sentences reflected the charging decisions of prosecutors, because more severe charges carry longer sentences. Sentencing depends on several factors (including jurisdiction and personal and criminal history), and the report does not attempt to make any generalizations about sentencing across all cases. The sentences sought were an average three times the length for Category A as Category B perpetrators (230 months for Category A perpetrators and 76 months for Category B). The sentences issued were on average four times the length for Category A as Category B (211 months for Category A and 53 months for Category B). These numbers do not include cases where life sentences were sought or achieved, as they are difficult to quantify. It excluded the case of Robert James Talbot, Jr., where a sentence of 78 months was issued but the government sentencing memorandum was sealed and thus inaccessible. Category A bomb plots were provided the bombs more often by law enforcement. Law enforcement provided weapons, including assault rifles and inert explosives, for two-thirds of the Category A plots, while eight out of ten of the Category B perpetrators acquired their own weapons. In most Category B cases (except two), the perpetrators obtained or made their own weapons or bombs. One of the two exceptions was that of Frederick Thomas, which involved a plot to bomb federal buildings and murder federal officials and in which an FBI informant sold the suspect some materials - a silencer and materials that were supposedly C-4 explosive. In an additional Category B case, law enforcement assisted the perpetrator in developing the instrumentality (as opposed to providing a weapon). In the case of Glendon Scott Crawford, which involved an attempt to build an x-ray weapon of mass destruction, an FBI informant provided the suspects with x-ray specifications and technical assistance. The figures are different on the Category A side. Law enforcement provided Category A perpetrators weapons, including assault rifles and explosives, in two-thirds of the cases (eight of 12). Category A violent plots were significantly more likely to be prosecuted as terrorism cases. Category A perpetrators had terrorism-related charges in about five-sixths of cases (10 of 12). Compare this to Category B perpetrators who experienced terrorism-related charges in about one out of six cases (two of 12). Prosecutors may not have the same charges available to use in every case. However, at least six of the Category A cases involved WMD charges that conceivably could receive lesser charges, as was the case with Category B cases. Cases that involved terrorism enhancements —optional boosts to sentences that prosecutors can pursue if they argue a case was terrorism—accounted for about two-thirds of the Category A set (seven of 12) and only a quarter (three of 12) of the Category B set. U.S. District Judge Ann Montgomery said to Buford Rogers, a self-proclaimed member of the anti-government militia Black Snake Militia, that “I don’t think you are a terrorist or part of a conspiracy.” Rogers was charged with making homemade bombs using military-grade PETN, crafting Molotov cocktails (filled with “homemade napalm”), and possessing a loaded SKS rifle. He cheered the Boston marathon bombing and discussed using the weapons locally. The case was initially investigated as a terrorism case based on initial evidence, with the FBI stating that it "believes that a terror attack was disrupted by law enforcement personnel and that the lives of several local residents were potentially saved." Ultimately however, Rogers was charged with being a felon in possession of a firearm and sentenced to three years and four months in prison. Criminal charging documents referenced Muslim-associated ideologies in all of the Category A violent plots, but referenced ideologies in half of the Category B violent plots. Criminal charging documents (such as a complaint or indictment) are filed before a court to formally accuse a person of a crime. They are usually the first step in criminal proceedings and the first public information available in a case. They are often accompanied by sworn statements by investigating officers who set forth the facts of the case. As such, they can be an important reference for the public and press in understanding what is alleged against a defendant. Muslim-associated ideologies were mentioned in every Category A violent plot. Six of the 12 Category B cases referenced perpetrator ideology. The six that did not simply referenced the conduct plotted by the perpetrator without discussing the ideological intent. These facts either came up in the proceedings or were otherwise reported by the press. 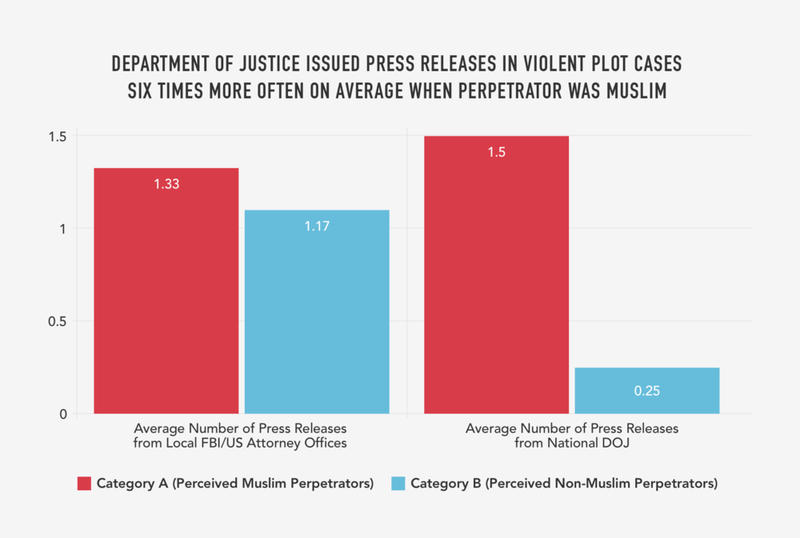 On average, the national Justice Department issued six times as many press releases in Category A violent plots. Releases coming from local FBI field offices and U.S. Attorney offices were more consistent across both Category A and Category B. Prosecutor press releases can be issued for a variety of reasons, but they are one way for prosecutors to get a message about the case to the press. Press releases provide basic case information that gets reported in the press, so the way issues are framed in releases contributes to the way they are reported. If releases omit discussion of a perpetrator’s ideology, it is less likely that reporting of that story will include that information. Many factors go into the publication of press releases, including factors that may not address the merits of any specific case, such as a press officer being off the desk. The discussion of press releases does not attempt to explain why releases may be issued in some cases and not others or why certain cases receive attention from the Washington, DC, press office while others receive local press releases. However, the discrepancies between Categories A and B in some instances merit further investigation. Justice Department national press releases referenced ideology more often in Category A violent plots. About half of national releases described Muslim-associated ideologies in either the headline or first paragraph of the release. Only a quarter of the Category B plots had releases, and all three mentioned the perpetrator’s identity further into the release. The majority of press releases referenced perpetrator ideology at some point in the release. This report seeks to raise awareness about the possible bias with which ideologically motivated violent incidents and plots are covered in the media and handled by government and legal institutions depending on the identity and ideology of the perpetrator. Increasing standardization and reducing biases will improve the justice system and therefore the wellbeing and civil rights of all Americans. The research presented in this report is meant to build capacity and understanding among critical stakeholders to address disparities in labeling and identifying incidents of ideologically motivated violence, while also promoting the continued prevention and investigation of all types of violence. A noteworthy case that did not ultimately become part of the analysis was that of Sami Samir Hassoun. On a Saturday night in Chicago in September 2010, he allegedly placed an inert bomb provided by the FBI in a trash can located near both a Wrigley Field entertainment area and a crowded bar. Hassoun’s ideology and motivation seem to be implied by media reports as being related to his Arab/Lebanese background. Nearly every article referred to his immigrant status or ethnic background, and the opening paragraph in a News Roundup in the Washington Post on April 24, 2012, referred to him as “a man of Lebanese descent.” However, law enforcement did not allege that he had a Muslim-associated ideology. Instead, law enforcement alleged that he acted for monetary gain and to cause political instability. He was charged with a WMD-related charge and received a 23-year prison sentence. The Justice Department issued three national press releases about his case which highlighted his national origin. The case is significant because the outcome more closely resembles a Category A case than a Category B case. Because of the emphasis on national origin, the case raises important questions as to the conflation of religion, race, and national origin. While this research study looked solely to the perceived religion of the perpetrator, future research might factor in perceptions of race as well. The Justice Department appears to recognize the disparity in legal tools available; Reuters reported in February 2016 that the Justice Department was considering ways to more even-handedly address domestic IMV. The Assistant Attorney General for National Security, John Carlin, said that his office was taking a “thoughtful look at the nature and scope of the domestic terrorism threat” and planned to analyze “potential legal improvements and enhancements to better combat those threats.”  However, civil liberties groups have expressed concern about both the potential reach of efforts to address domestic terrorism and the potential misuse of tools to criminalize activist organizations engaged in First Amendment activities. The answer is not necessarily to prosecute Category B offenders more. This report does not seek to answer how to address disparities in treating Category A or B cases, but cautions that any responses should promote civil liberties. In sting operations, law enforcement efforts use undercover asset to pretend to participate in or encourage a criminal act, and arrest the suspect before the act is fully committed. 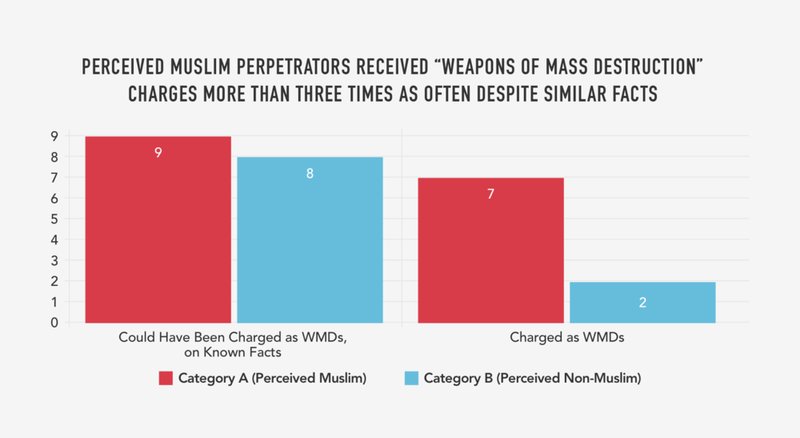 The data showed that, in the violent plots examined, Muslim-perceived perpetrators were provided the means to commit a crime two-thirds of the time (often being unable to afford them or acquire them on their own), while non-Muslim-perceived perpetrators of violent plots already had or were stockpiling weapons or explosives. The media investigation involved two levels of analysis, incident-level and article-level analyses. Each incident was researched through the Nexis program to find print coverage from the New York Times and Washington Post. Searches were restricted to print stories from the starting date of the incident until April 30, 2017. Unique Boolean search phrases were generated using the following criteria: date and location; target(s) of incident; name(s) of perpetrator(s) where known; and name(s) of victim(s) where applicable. Once the list of articles was generated within Nexis, two rounds of researcher review were conducted to eliminate non-responsive articles. Whether the articles referenced the mental or psychiatric condition of the perpetrator. The legal proceedings and outcomes of cases were obtained using a combination of PACER (Public Access to Court Electronic Records), Lexis, state-level case databases, and other legal tools where applicable. Typically, cases were identified by way of the jurisdiction where the violent act was committed and the name of the perpetrator. Whether the instrumentality of the offense was provided by law enforcement. In addition, the legal layer included another set of searches for each case via Nexis and Google News to identify key words of the incident, such as perpetrator name and location, in order to find law enforcement press quoted in print media or written press releases. This was done primarily to assess whether any press releases or media statements were issued from the Justice Department. The reason for this was to identify in what cases the Justice Department was delivering press, and if so, whether it was issued locally or nationally. Ideologically motivated violence (IMV): A violent act or plan to commit violence that is perceived by a) the media and/or b) law enforcement to be committed to promote an ideology. For purposes of this study, an incident is considered “perceived to be ideologically motivated” if it was included in one of the underlying datasets. All three of the incident databases collected incidents according to law enforcement allegations in charging documents and/or national media portrayal of the perpetrator. Category A perpetrator: Individuals committing or plotting violent acts who are perceived to be Muslim and allegedly acting in the name of Islam. Category B perpetrator: Individuals committing or plotting violent ideologically motivated acts who are not perceived to be Muslim. Category A/B set: All cases belonging to either Category A or Category B in the study. Plot: A plan to commit a violent act that law enforcement alleged was attempted but not carried out to completion. Common less-severe criminal charges in IMV cases: While this list is not comprehensive of every possible federal charge in an IMV case, these are some more common charges that come up. They are considered “less severe” because the maximum prison sentences are less than offenses associated with federal terrorism laws. Felon in possession of a firearm (10-year maximum). Convicted felons are barred under federal law from possessing firearms. This means that individuals with a criminal history who are planning a violent plot and acquire weapons to carry out that plot can be subject to a separate offense. Possession or distribution of explosives or the means to make explosives (10-year maximum). This category of charges comes up frequently in alleged bomb plots, in which a perpetrator possesses explosives or the capability to create them. Common more-severe criminal charges in IMV cases: This list is not comprehensive as to every possible federal charge in an IMV case. These are considered “more severe” because they carry heightened prison sentences, can lead to harsher post-confinement conditions (higher-security facilities and limitations on communication), and are associated with federal terrorism statutes. Terrorism enhancement : An optional substantial increase to a prison sentence that a federal judge can impose if prosecutors argue for it and a judge determines that the crime involved or was intended to promote a federal crime of terrorism. Federal judges have criteria (called “sentencing guidelines”) that are set by Congress in order to determine how to sentence an individual convicted of a crime. The criteria rely on numerous factors including the nature and severity of the offense and the criminal history of the defendant. In federal criminal cases, prosecutors often submit a “sentencing memorandum” which outlines the prosecutor’s argument for why a defendant should receive a certain sentence, and the factors, including any enhancements, for doing so. START Global Terrorism Database, Southern Poverty Law Center (SPLC) Lone Wolf Database, and The Intercept Terror Trials Database, further outlined in the Methodology section below. Incidents beyond 2015 were not included in the dataset as the START Global Terrorism database did not yet contain 2016 data at the start of this research project. Thus, significant incidents or plots perceived to be ideologically driven such as the Orlando Pulse Nightclub shooting or Kansas anti-Muslim “Crusaders” plot were not part of this study. This excludes cases where life sentences were sought or obtained. There were more life sentences sought and obtained for Category A perpetrators (two sought and two obtained for Category A, and one sought and not obtained for Category B). Sentencing relies on a number of factors, including the criminal history of the defendant, the jurisdiction, the judge, and others. The report points out the correlation between heightened charges and higher sentences but does not make any conclusions regarding sentencing procedures. Does not require “WMDs” in a traditional understand of nuclear, biological, or chemical weapons, but can apply to conventional explosives like small bombs and grenades. This report does not claim that law enforcement never engages in sting operations of Category B perpetrators, but that these results were found in the underlying data. An instance of “media coverage” is defined as an article that references an incident, using identifying metrics regarding the incident. FTOs are non-U.S. organizations that are designated by the U.S. State Department pursuant to section 219 of the Immigration and Nationality Act (INA). Ryan J. Reilly, “There’s A Good Reason Feds Don’t Call White Guys Terrorists, Says DOJ Domestic Terror Chief,” Huffington Post, January 11, 2018. See, e.g., Khaled Beydoun, “Islamophobia: Toward a Legal Definition and Framework,” Columbia Law Review Online 116 (2016): 108–125. ISPU American Muslim Poll 2016. Emile Bruneau, Nour Kteily, and Emily Falk, “Revealing an Intergroup Bias in Collective Blame Decreases Islamophobia and Anti-Muslim Hostility,” Annenberg School of Communications, University of Pennsylvania, Philadelphia, PA, Kellogg School of Management, Northwestern University, Chicago, IL, U.S.
 See Haroon Moghul, “America’s Obsessive Fear of Islam Is Distracting Us from the Real Problem of Gun Control,” Quartz, December 3, 2015. See Brian Resnick, “All Muslims Are Often Blamed for Single Acts of Terror. Psychology Explains How to Stop It,” Vox.com, November 30, 2017. Shaun King, “The White Privilege of the ‘Lone Wolf’ Shooter,” The Intercept, October 2, 2017; see also Kiana Fitzgerald, “The Danger in Calling White Male Terrorists ‘Lone Wolves,’” Complex, October 5, 2017. See, e.g., Doug Criss, “When Is a Crime a Hate Crime and When Is It Terrorism?,” CNN, August, 14, 2017; Anne Godlasky, “When Is It Terrorism? When Is It a Hate Crime?,” USA Today, November 6, 2017. Maggie Ybarra, “Majority of Fatal Attacks on U.S. Soil Carried Out by White Supremacists, Not Terrorists,” The Washington Times, June 24, 2015. Doug Criss, “When Is a Crime a Hate Crime and When Is It Terrorism?,” CNN, August 14, 2017. Colleen E. Mills, Joshua D. Freilich, and Steven M. Chermak, “Extreme Hatred: Revisiting the Hate Crime and Terrorism Relationship to Determine Whether They Are ‘Close Cousins’ or ‘Distant Relatives,’” Crime & Delinquency (December 2015). Jean-Paul Marthoz, Terrorism and the Media: A Handbook for Journalists (UNESCO, 2017). “The key challenge for journalists is to inform with rigor and responsibility in the middle of chaos and urgency,” said Marthoz. “In such dramatic circumstances, journalists should be seen as trusted sources of information, able to separate facts from rumors and opinions from incendiary speech. The independent search for truth as well as the ethics of respect for the victims are crucial.” “UNESCO Urges Terrorism Reporting Free from Fear-Mongering,” UNESCO.org, March 23, 2017. Conor Friedersdorf, “The Horrifying Effects of NYPD Ethnic Profiling on Innocent Muslim Americans,” The Atlantic, March 28, 2013. Arshad Ahmed and Farid Senzai, The USA Patriot Act: Impact on the Arab and Muslim American Community (Institute for Social Policy and Understanding, 2004). Enny Dasa, Brad J.Bushmanab, Marieke D.Bezemera, Peter Kerkhofa, and Ivar E. Vermeulena, “How Terrorism News Reports Increase Prejudice Against Outgroups: A Terror Management Account,” Journal of Experimental Social Psychology 45, no. 3 (May 2009): 453–59. Owais Arshad, Varun Setlur, and Usaid Siddiqui, Are Muslims Collectively Responsible? (416Labs, 2015). Erin M. Kearns, Allison Betus, and Anthony Lemieux, Why Do Some Terrorist Attacks Receive More Media Attention Than Others? (March 7, 2017). This report argued that social identity is the largest predictor of news coverage, while target type, being arrested, and fatalities will also impact coverage. It looked to news coverage from LexisNexis Academic and CNN.com for incidents in the United States between 2011 and 2015; see also Mohammed El-Nawawy and Mohamad Hamas Elmasry, “Valuing Victims: A Comparative Framing Analysis of the The Washington Post’s Coverage of Violent Attacks Against Muslims and Non-Muslims,” International Journal of Communication 11 (2017): 1795–1815. Joshua D. Freilich, Jeff Gruenewald, Steven Chermak, and William Parkin, “Was the Orlando Shooting a Hate Crime or Terrorist Act? The Answer Matters,” The New Republic, June 15, 2016. Scott Shane, “Homegrown Extremists Tied to Deadlier Toll Than Jihadists in U.S. Since 9/11,” New York Times, June 24, 2015. Kurt Eichenwald, “Right-Wing Extremists Are a Bigger Threat to America Than ISIS,” Newsweek, February 4, 2016. “White Supremacist Extremism Poses Persistent Threat of Lethal Violence,” May 10, 2017. See Bipartisan Policy Center, “Jihadist Terrorism-A Threat Assessment,” September 2013, 15–16; Michael Reynolds, “Homegrown Terror,” Bulletin of the Atomic Scientists 60, no. 6 (Nov./Dec. 2004), describing a case in Noonday, Texas, where anti-government extremists were arrested with, among other things, a cyanide bomb capable of killing up to 6,000 people; Barton Gellman, “The Secret World of Extreme Militias,” Time, September 30, 2010, citing another plot to detonate an explosive radiological dispersal device (“dirty bomb”) by a Neo-Nazi sympathizer living in Belfast, Maine. Marcy Wheeler, “Yes, Calling Only Muslims Terrorists Does Result in Disparate Treatment of Muslims,” Emptywheel, December 5, 2015; see also Creating Law Enforcement Accountability & Responsibility (CLEAR) Project, Muslim American Civil Liberties Coalition (MACLC), Asian American Legal Defense and Education Fund (AALDEF), Mapping Muslims: NYPD Spying and Its Impact on Muslim Americans (2012). Alejandro J. Beutel, “Latest FBI Numbers Show Anti-Muslim Hate Crimes Continue to Rise, Suggest Growing Shift Toward Violence Against People,” SPLC.org, November 14, 2017; see also Craig Considine, “The Racialization of Islam in the United States: Islamophobia, Hate Crimes, and ‘Flying while Brown,’” Religions 8, no. 165 (2017). See, e.g., Azadeh Aalai, “Media Framing Effects: When Is the ‘Terrorism’ Label Used?,” Psychology Today, June 21, 2017. Jesenia F. Robles, “Islam Is the New Black: Muslim Perceptions of Law Enforcement,” McNair Scholars Research Journal 13, no. 1, art. 16. (2017). Robert J. Sampson and Janet L. Lauritsen, The Sentencing Project (1997). See also Michelle Alexander, The New Jim Crow. Andrew Kahn and Chris Kirk, “What It’s Like to Be Black in the Criminal Justice System,” Slate.com, August 9, 2015; Christopher Hartney and Linh Vuon, Created Equal: Racial and Ethnic Disparities in the U.S. Criminal Justice System (National Council on Crime and Delinquency, March 2009). See, e.g., Nazgol Ghandnoosh, Racial Perceptions of Crime and Support for Punitive Policies (The Sentencing Project, 2014); Brian Powell, “Fox News’ Racial Crime Coverage Is Hurting People,” Media Matters for America, August, 23, 2013; Roger D. Klein and Stacy Naccarato, “Broadcast News Portrayal of Minorities: Accuracy in Reporting,” American Behavioral Scientist 46, no. 12 (2003); The Opportunity Agenda, Media Representations and Impact on the Lives of Black Men and Boys. Media framing and legal outcomes are deeply interconnected. See, e.g., Ellen Nakashima, “60 Charged with Terrorism-Linked Crimes in 2015,” Washington Post, December 27, 2015 (noting that the “Justice Department has charged at least 60 individuals this year with terrorism-related crimes” while citing IMV incidents involving only Muslim-perceived perpetrators). 18 U.S. Code § 2339B (Providing material support or resources to designated foreign terrorist organizations); Christopher S. Stewart, “Little Gitmo,” NY Magazine, July 10, 2011. See, e.g., Global Terrorism Database FAQs, accessed February 10, 2018 (“In the absence of a universally accepted definition of terrorism, GTD uses several coded criteria to cover a broad range of definitions of terrorism through a combination of inclusiveness and filtering. The goal is to have a data set that is useful to as many interested users as possible.”); see also FBI, “Terrorism 2002–2005” (“There is no single, universally accepted, definition of terrorism. Terrorism is defined in the Code of Federal Regulations as “the unlawful use of force and violence against persons or property to intimidate or coerce a government, the civilian population, or any segment thereof, in furtherance of political or social objectives”) (citing 28 C.F.R. Sec. 0.85). “Anti-Muslim Discrimination,” ACLU.org; Rebecca A. Clay, “Islamophobia,”American Psychology Association 48, no. 4 (April 2017). Human Rights Watch and Columbia Law School’s Human Rights Institute, Illusion of Justice: Human Rights Abuses in U.S. Terrorism Prosecutions (July 2014). The usage of the phrase “perceived to be” addresses the inherent problem in identifying a perpetrator’s ideology with any certainty. Oftentimes, perpetrators may not subscribe to clear ideologies, or they may be motivated for a range of reasons. In other instances, an individual may claim to subscribe to an ideology, but this claim may be disputed by other members of that ideology or community. The research team is not in a position to determine who belongs to what ideology or identity. Instead the perception of a perpetrator’s ideology or identity is drawn from the underlying datasets, court documents, such as criminal complaints, that accuse an individual of belonging to an ideology, or media stories that portray an individual of being motivated in a certain way. Joe Pompeo, “Taking Stock of Newsroom Head Counts,” Politico, December 1, 2014. Washington Post Staff, “Policies and Standards,” January 1, 2017; New York Times Company, “Standards and Ethics,” 2018. See, e.g., Jim Kuypers, Press Bias and Politics: How the Media Frame Controversial Issues (Praeger, 2002); Tim Groseclose and Jeffrey Milyo, “A Measure of Media Bias,” The Quarterly Journal of Economics 120, no. 4 (November 2005). This date was chosen to coincide with the start of this report’s data collection in May 2017 and to maximize the amount of news coverage available for review, including a period that covers the start of the presidential administration of Donald Trump. National Consortium for the Study of Terrorism and Responses to Terrorism (START), Global Terrorism Database (GTD). Southern Poverty Law Center (SPLC), Lone Wolf Report, February 11, 2015. The report is based on incidents of domestic terrorism. Trevor Aaronson and Margot Williams, “Trial and Terror,” The Intercept, April 20, 2017. Global Terrorism Database (GTD), Data Collection Methodology. The SPLC set looked at “terrorism inspired by antigovernment, Islamist and various forms of race or group hatred.” Southern Poverty Law Center (SPLC), Lone Wolf Report, “The Study,” February 11, 2015. The only primary or high-intensity incident removed due to this geographical consideration was that of Ismaaiyl Abdullah Brinsley, the gunman who ambushed and murdered two New York City Police Department Officers in December 2014. A handful of plots involving targets within New York City or Washington, DC, that arose during during the generation of the plots dataset were also excluded. Some high-profile incidents—such as the Orlando nightclub shooting, or several other notable incidents of 2017—do not appear as a result of the date restriction. Bennett Gershman, “The Prosecutor’s Duty of Silence,” Albany Law Review 79 (2016): 1183–1219. Ryan J. Reilly, “Sessions’ DOJ Charged a White Supremacist with Terrorism. They Just Didn’t Tell Anyone,” Huffington Post, January 9, 2018. Spencer Ackerman, “Let’s All Stop Saying ‘Weapons of Mass Destruction’ Forever,” Wired, March 29, 2013. One Category A bomb plot, that of Burson Augustin, was charged as material support and thus is not included in this list. Department of Justice, U.S. Attorney’s Office, Northern District of New York, “Upstate New York Man Convicted for His Role in Attempting to Acquire a Lethal Radiation Device,” August 21, 2015. According to the FBI, “No evidence was uncovered to conclude this attack was directed or facilitated by any white supremacist group.” FBI Milwaukee, “Oak Creek Sikh Temple Shooting Investigation Conclusion,” November 20, 2012. See, e.g., John McWhorter, “The Big Problem with Calling It ‘Radical Islam,’” CNN, July 11, 2016. Kristina Sgueglia, “Chattanooga Shootings ‘Inspired’ by Terrorists, FBI Chief Says,” CNN, December 16, 2015. “FBI Warned of Planned Parenthood Attacks Months Ago,” CBS News, November 27, 2015. Because so few articles were written at all referencing Category B Plots (13 total articles across 13 incidents, with the majority of incidents having no articles at all), term searches for this specific dataset of Category B Plots are not included in this report. While these three words all stand for varying but closely related concepts, they were searched and reported together for purposes of this research project. Federal Hate Crimes are prosecuted under 18 U.S.C. 249, including attempted crimes (but not those involving sexual abuse, kidnapping, or murder) which carry a maximum sentence of ten years. Compare to Federal Weapons of Mass Destruction prosecutions brought under 18 U.S.C. 2332(a), and often brought against Category A Perpetrators, which have no maximum sentence even for attempted crimes. For further analysis of the distinction between hate crimes and terrorism, see Wadie E. Said, “Sentencing Terrorist Crimes,” Ohio State Law Journal 75 (2014): 477–528; Anthony H. Cordesman Terrorism and Hate Crimes: Dealing with All of the Threats from Extremists (Center for Strategic and International Studies, 2017). See, e.g., 18 U.S.C. § 249(a)(1)(A); 18 U.S.C. § 2332a(a). As indicated above, the total universe of articles referencing Category B Plot offenders was itself extremely small (just 13 total), and therefore percentages of term usage in articles for this set were not used in this report. See, e.g., Peter Baker, “A Nation Wonders When Bloodshed Becomes Terrorism,” New York Times, December 3, 2015. A terrorism enhancement is an optional large increase to a prison sentence that a federal judge can impose if (1) prosecutors argue for it and (2) a judge determines that the crime involved or was intended to promote a federal crime of terrorism. Press Release, FBI Minneapolis, “Suspect Buford Rogers Arrested in Montevideo,” May 6, 2013. Robert Wynne, “How to Write a Press Release,” Forbes, June 13, 2016. Michael Schulson, “The Islamophobia Election: How ‘Muslim’ Became a Racial Identity,” Religion Dispatches, November 7, 2016. Scott Sullivan, “Prosecuting Domestic Terrorism as Terrorism,” Just Security, August 18, 2017. 18 U.S.C. § 2339B (Providing material support or resources to designated foreign terrorist organizations); U.S. Department of State, Bureau of Counterterrorism and Countering Violent Extremism, “Terrorism Designations FAQs,” July 10, 2012. Julia Harte, Julia Edwards, and Andy Sullivan, “U.S. Eyes Ways to Toughen Fight Against Domestic Extremists,” Reuters, February 4, 2016. Donna Lyons, “States Enact New Terrorism Crimes and Penalties,” National Conference of State Legislatures 27, no. 19 (November 2002). Lisa Daniels, “Prosecuting Terrorism in State Court,” LawFare, October 26, 2016. Mike James, “Racist ‘Assassin’ Indicted as Terrorist in NYC Murder of Black Man,” USA Today, March 27, 2017. Taylor Brown, “Terrorism vs. Hate Crime: How U.S. Courts Decide,” BBC News, June 20, 2015. Department of the Treasury, Internal Revenue Service, Financial Investigations: A Financial Approach to Detecting and Resolving Crimes (1994), 274–75. William Wan, “Sting Underscores Muslims’ Complex Relationship with FBI,” Washington Post, October 28, 2010. Eric Lichtblau, “F.B.I. Steps Up Use of Stings in ISIS Cases,” New York Times, June 7, 2016. Federal litigation is currently ongoing on the use of sting operations in drug cases and biased targeting of Black defendants. See Jason Meisner and Annie Sweeney, “Was Racial Profiling Behind ATF Stash House Stings? Chicago Judges to Take Up Landmark Case Today,” Chicago Tribune, December 13, 2017. Human Rights Watch, Illusion of Justice: Human Rights Abuses in U.S. Terrorism Prosecutions, July 21, 2014. Each of these terms were searched alongside corollary words (Boolean searching: terror! ; extrem!) to account for different phrases such as terror, terrorist, and terrorism or extreme (as in views or ideology of perpetrator), extremist and extremism. Hate was also searched as in hateful ideology, hate crime, or that perpetrator harbored hate. Non-responsive uses of the terms were excluded. The findings cited in this report are an aggregation of all these respective terms for each phrase, and their use in this report reflects that same aggregation. 18 U.S.C. § 922(g)&(n). The maximum is 15 years in some cases involving repeat violent offenses. 18 U.S.C. § 2339A & 2339B. Nicole Hong, “‘Material Support’ Statute Is Front and Center in Antiterror Push,” Wall Street Journal, May 27, 2015. 18 U.S.C. § 2332a; see also 18 U.S.C. § 921(a)(4). Wadie E. Said, “Sentencing Terrorist Crimes,” Ohio State Law Journal 75, no. 3 (2014).